The Institute has a professional projects division that offers consulting services to clients. Typically, clients seek out the IwB’s professional services to develop the design brief for a project which allows them to access investment opportunity and/or to mobilize a community. The IwB is often called upon to address “wicked” problems that require multiple stakeholder engagement and pre-planning to reach project viability. The IwB’s past professional projects have included feasibility studies, community engagement processes, recommendations and phasing of projects, and project management, and coordination of professional teams to deliver client projects. The professional projects division leverages the IwB’s team of student, alumni, staff, and faculty experts to provide unique resources to clients. By working with the IwB, clients gain access to the Institute’s extensive network of Canadian and international experts from diverse fields as well as emerging talent. 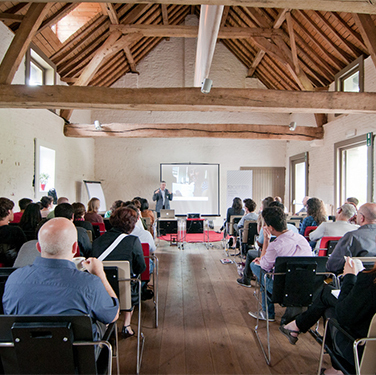 The Institute’s consulting services are primarily conducted through the charrette process. 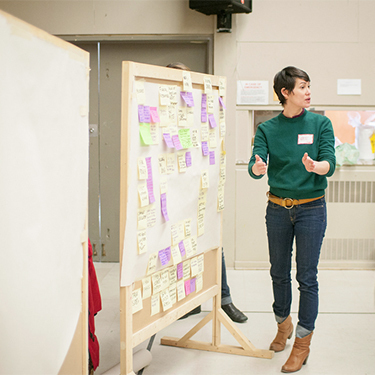 The IwB facilitates each charrette with the intention of generating holistic results that target the ecological, economic, social, political and cultural complexities of the project, as well as addressing the diverse needs of multiple stakeholders. The IwB has perfected its charrette method to allow for a deep engagement between stakeholder, students, and design experts. Our interdisciplinary approach combined with our philosophy of co-creation and whole systems thinking creates complete solutions to complex problems. The Institute has completed over 50 charrettes for residential, commercial and institutional projects. Past clients include Windsor Essex Community Housing, Canada Mortgage and Housing Corporation, Habitat for Humanity, Sony Centre, TAS Design Build, Dublin City Council, Peel Living, Magna Aftermarket, the Government of Costa Rica, the City of Toronto, and many others (see our projects page). The IwB customizes its collaborations delivering practical solutions through tested research and design methods. Our success is reflected in our continuing collaborations with past partners. We have created a strong multi-organizational network of like minded collaborators and our network continues to grow as does the breadth and diversity of our projects. If you are interested in working with the IwB on a project, please contact us. In addition to the professional projects stream, the IwB also has an academic division and special projects division. 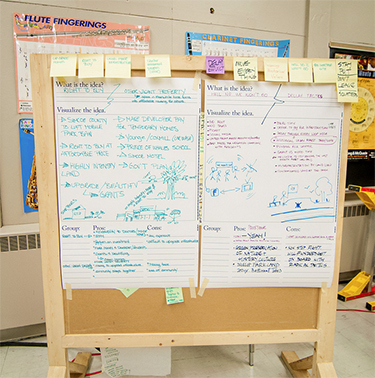 IwB brainstorming board during a charrette.